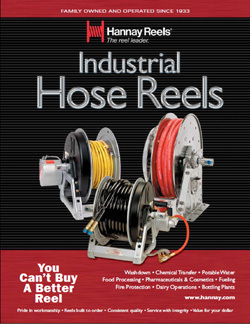 Durable metal reels of all types (hose, cable, storage) Hannay builds over 70,000 durable metal reels of all types (hose, cable, storage) per year, for customers throughout the world. Reel sizes vary from hand portable to over 12 feet in length. 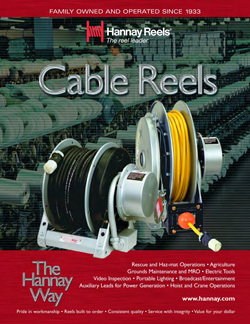 Much of the success of Hannay Reels can be attributed to the company’s emphasis on quality, service, and delivery: The technology behind the design and manufacture of Hannay Reels has steadily evolved since the company began in 1933, and Hannay Reels continues to set the standard for the entire industry. Employees at Hannay Reels all share the pride in their work that founder Clifford B. Hannay had. Hannay Reels is a modern company with state-of-the-art facilities. Craftsmanship is just as important as technology, and customers find this craftsmanship in everything the company does, from reel design, to manufacturing, to shipping, to service… that’s The Hannay Way.